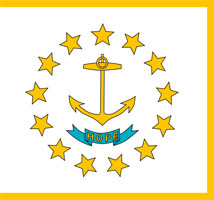 The State of Rhode Island and Providence Plantations, is a state in the northeastern New England region of the United States. As part of the 13 original colonies, it became the first to declare its independence from Great Britain although it was the last to ratify the Constitution of the United States. There is a concentration of industry and population in this smallest of North American states that it has virtually become a city-state, but there still remains a considerable expanse of unspoiled natural beauty in the islands of Narragansett Bay and other places. Providence is Rhode Island’s capital and its largest city. The state is not really an island, making its name a paradox, as most of the state is part of the mainland. The name is the official name of the biggest island of Narragansett Bay. There are disagreements between historians regarding the origin of the name itself, but its official nickname is the Ocean State, while unofficially, due to its small size and almost inconspicuousness in most maps, it is also called Little Rhody. The Ocean State is renowned as a vacation state because of its extensive shoreline and mild summer climate. Newport, one of the nation’s most famous resorts, is located in Rhode Island. A number of historical sites will appeal to visitors as well, such as Touro Synagogue National Historic Site in Newport, which preserves the oldest North American synagogue; Roger Williams National Memorial in Providence, the state’s only national park; the State House in Providence; the oldest Baptist church in the United States, the First Baptist Church in Providence; the first fully automated post office in the United States, the main US post office in Providence; the Crescent Park Carousel in East Providence; and, the Green Animals topiary gardens, started in the late 1800s by Thomas Brayton. Block Island, in addition to Newport, is a popular resort, the bluffs stretching along the southern shore offer magnificent scenery, and its lighthouse has the most powerful beacon on the East Coast of North America.